Cannon Towers provide superb additional firepower to any defence. 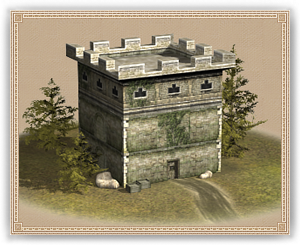 Constructing Ballista Towers atop settlement walls allows a defending force to shower any attackers with iron bolts, a sensible improvement for almost any siege scenario. Any besieging force has to stay beyond range until the moment of their attack, and must then run a terrible gauntlet of missile fire.